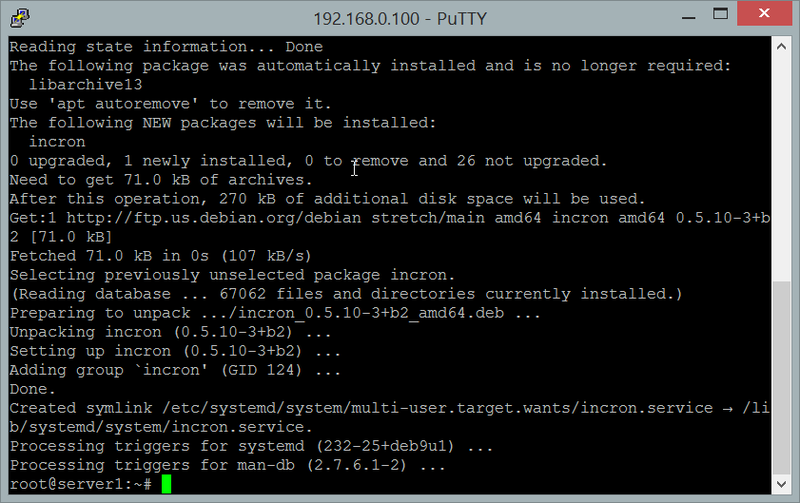 This guide shows how you can install and use incron on a Debian 9 (Stretch) system. Incron is similar to cron, but instead of running commands based on time, it can trigger commands when file or directory events occur (e.g. a file modification, changes of permissions, etc.). System administrator permissions (root login). All commands in this tutorial should be run as root user on the shell. I will use the editor "nano" to edit files. You may replace nano with an editor of your choice or install nano with "apt-get install nano" if it is not installed on your server. The installation process should be similar to the one in this screenshot. Incron usage is very much like cron usage. You have the incrontab command that let's you list (-l), edit (-e), and remove (-r) incrontab entries. And add the following line. Then save the file. ...where <path> can be a directory (meaning the directory and/or the files directly in that directory (not files in subdirectories of that directory!) are watched) or a file. Additionally, there is a symbol which doesn't appear in the inotify symbol set. It is IN_NO_LOOP. This symbol disables monitoring events until the current one is completely handled (until its child process exits). /tmp/ IN_MODIFY echo "$$ [email protected] $# $% $&"
Then you create or modify a file in the /tmp directory and take a look at /var/log/syslog - this log shows when an incron job was triggered, if it succeeded or if there were errors, and what the actual command was that it executed (i.e., the wildcards are replaced with their real values). In this example I've edited the file /tmp/hello.txt; as you see [email protected] translates to /tmp, $# to hello.txt, $% to IN_CREATE, and $& to 256. I used an editor that created a temporary .txt.swp file which results in the additional lines in syslog. That's it. For test purposes, you can modify your Apache configuration and take a look at /var/log/syslog, and you should see that incron restarts Apache. $user/.ssh/known_hosts IN_MODIFY echo "$$ [email protected] $# $% $&"
why incrontab don't work in this case? what can be done to make it work? maybe some other tool? Make sure you setup your incron monitoring using incrontab -e. You can't call Incron within a script.